Most gardeners are interested in extending the growing season, especially those living in colder climates where the growing season just isn't as long. If you don't think it's worth trying, imagine enjoying tomatoes a month early! Succession planting and cold frames are a couple of options to extend your harvest. We've provided you with the basics of what it means to extend your growing season, as well as a few ideas to test out in your own garden. The first frost and last frost dates for your area are the bookends to your growing season. Many cool-season crops — like lettuce, spinach, peas and broccoli — can tolerate some frost (around 32 degrees Fahrenheit, or 0 degrees Celsius), but few crops can sustain a hard freeze. And unless you live in hardiness zone 10 or south, you will likely experience freezing temperatures at one point or another. Most importantly, garden smart with the time you have. Start seeds indoors, or purchase starter plants. Direct sowing is great, but at the same time you start seeds, you could also transplant a thriving plant and be a few weeks ahead. Starting seeds early is especially important for plants with a long seed-to-harvest time, such as tomatoes, eggplants and peppers. For crops with a short seed-to-harvest time, direct-sowing in succession will help to extend your harvest as well. Green beans, carrots, spinach, lettuce and beets are all great to direct-sow in successive plantings. Sow a new batch every two weeks or so, during the appropriate season, right up until the last minute. Count back the numbers of days the plant needs to produce fruit from the average first frost date to determine your last possible opportunity to direct-sow. For frost-tolerant plants, you'll be able to push it even further. You can also get a head start in the spring, helping to warm the soil. According to GrowVeg, when soil temperatures reach a consistent 44.5 degrees F (about 6.9 degrees C), frost-tolerant plants like spinach, lettuce, peas and kale are ready to be sown. There are a couple of ways to facilitate warming up the soil in spring. Raised beds with good drainage are great because they tend to warm up more quickly. Saturated soil is slower to respond to temperature changes, so good drainage is key. To further aid the warming process, consider covering your soil with a couple layers of garden fleece or a single layer of thick black plastic. There are also ways to extend your growing season altogether, whether you want to get a head start in the spring or harvest later into the fall. Using any of the following methods will allow you to create warmer microclimates in your garden, capable of sustaining plants well into the freezing months. One Yard Revolution says that by using cold frames and other cover methods, you can create a microclimate in your garden equivalent to 1.5 zones south or further of your actual growing zone. These methods to extend your growing season take a little bit of effort, but when you're eating a garden-fresh salad at the end of December, it will all be worth it! Cloches and minigreenhouses are great for covering small salad gardens and other low growers. Lettuce, kale, spinach, beets and radishes would be great options. Just keep leafy greens well-harvested so they don't test the height of your cover. Glass or heavy-duty plastic cloches, like pictured above, are available for purchase. For a more frugal option, you could cut the top off a plastic milk jug and place it upside down over an individual plant. Other jugs and jars could work as well. They only have to let enough light through and allow enough room for the plant to grow. Also, on warmer days, you'll have to remove the jugs or jars if they don't allow for ventilation. 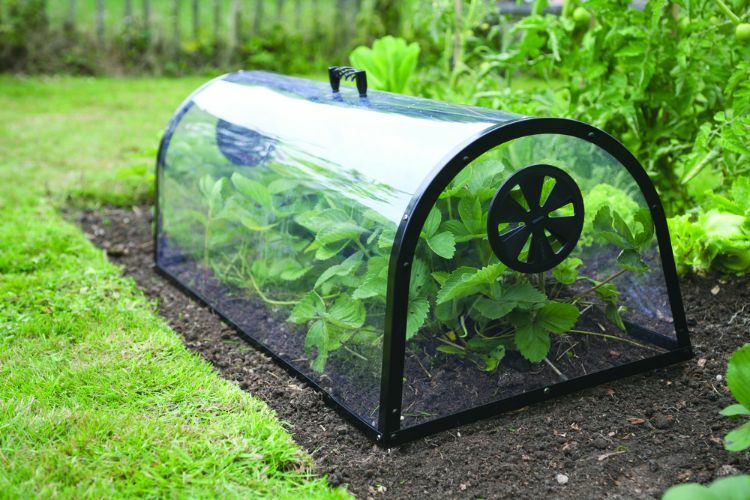 Cloches are also helpful for keeping seedlings protected from pests and damage in general. A cold frame is simply a box with a glass or heavy-duty plastic cover on top. 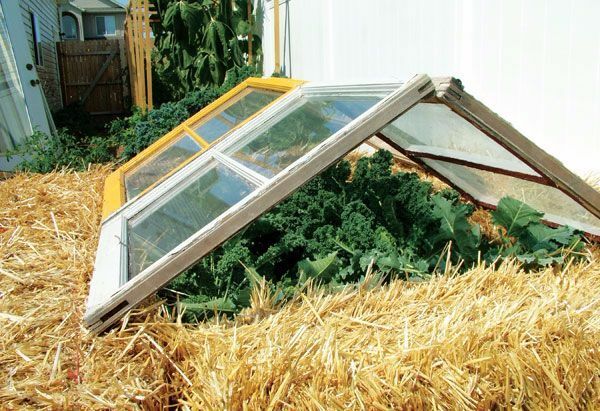 Most cold frames are built at an angle to increase sunlight exposure. It helps to choose a south-facing location for your cold frame. One Yard Revolution provides a helpful video tutorial on building your own cold frame. You could also use stacked stones, hay bales or bricks and cover them with old windows. The options are pretty endless, and you may find you have enough materials lying around to cobble something together. Hoop houses are great to use for larger gardens and existing raised beds. They require some planning, but you can put them together pretty simply using some PVC pipe, rebar and greenhouse plastic. One Yard Revolution provides another great video tutorial guiding you through the process of assembling a hoop house over an already existing raised bed. 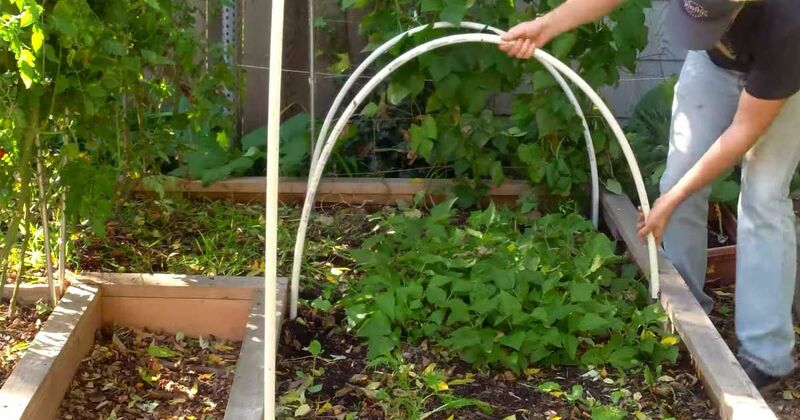 You can make a small hoop house to cover an existing garden or a large walk-in hoop house. Again, the options are endless, and you can get pretty creative with the materials you use.